Weather conditions over the winter period can vary from mild to extremely cold. If we are fortunate enough we may get a White Christmas it would be very wise to clear the snow from your Polytunnel or Glasshouse. Snow is very heavy and can cause structural damage if it builds up. You can remove it using a soft brush, a bed sheet or a rope (but if using a rope on a Polytunnel do be careful not to scratch your polythene as this reduces light transmission). 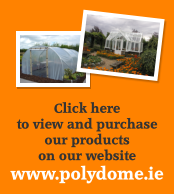 Many of our competitors Polytunnels were damaged by snow last year, luckily very few of our customers had any issues. Crop support bars are particularly helpful in Polytunnels to strengthen and protect against snow damage. A frost protection heater (which we supply a range of) can have the advantage of making snow melt before it can build up, helping to protect your Polydome Greenhouse or Polytunnel against structural damage.